Admit it, working moms are probably the busiest people on earth. How easy can it be to juggle careers, kids husbands and domestic work all at once? Yes, selflessness is the working mom’s mantra. More often than not, we never have time for ourselves much less the time to contour and highlight every morning (unless you’re one of those lucky ones who get to work from home! )Add those inevitable dark circles from waking up multiple times at night and you know the struggle to be on fleek and not look like a walking zombie is real! Keep your brows in check. You know what they say, brows are the window to your soul or something like that. Chances are you don’t have time to fill in and define your brows all the time. But a well-tweezed or threaded brow ensures that you do not have to think about them for at least three weeks. A great deal, if you ask me. There are some products that have multiple uses. For instance, there are two-in-one foundations and concealers which are perfect for covering those dark circles and cystic acne. So look out for products that have multiple uses like two-in-one lip liner/lipstick. Eyeliner/mascara in one, too! Choose multipurpose makeup brushes too. Sometimes, it can be so difficult to navigate the world of makeup. Brushes are another subject entirely but they are so much better than using your fingers. Why are you using makeup again if you want to use your fingers? Multipurpose makeup brushes are heaven-sent. Left to me, working moms need just three brushes: for foundation/concealer, powder, and brows. A red lipstick changes everything. To think that I thought lipsticks were overrated. Well, they are not. A good red lipstick has the power to take your look from 0 to 100. You think you look like someone died? Wear a red lipstick, a powerful red lipstick! Yes, there’s something like that! Have a go-to 5-minute face. 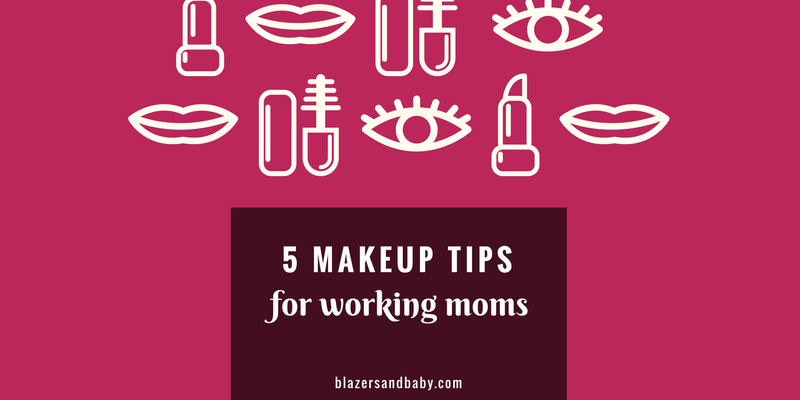 Judging by the number of makeup tutorials on YouTube, ‘5 minutes makeup’ is almost a myth but that shouldn’t stop you, multi-talented mama that you are, from developing yours. Have a go-to face that you can do in less than five minutes. With your threaded brows, foundation/concealer and red lipstick, that shouldn’t be a problem.